On 30th January 1661 they dug up Oliver Cromwell and hanged him at Tyburn! 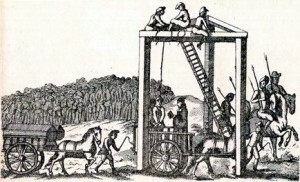 The Tyburn Gallows was situated at Marble Arch and the most common hangings were of catholics, pirates and highwaymen. If you look today the spot wheret he gallows once stood is marked by a stone plaque on the ground in a traffic island. Many people pass the spot without noticing its significance and a more popular activity these days might be to visit Speakers Corner. Every Sunday a spot anybody is permitted to go and stand on a soap box and speak their mind, like Prime Minister, John Major, once famously did at this famous location marked out for public debate. It was officially recognised as such in the great reform acts in 1872 but the tradition has existed for much longer than that. I highly recommend it if you are free on a Sunday. These days it’s a lot of religious people shouting at each other and there s always a goof argument to be heard, but you can talk about anything. One of the great things about free speech in this country. As for the gallows, the first recorded hanging took place here in 1196 and hangings continued until they were moved to Newgate prison in 1783. The condemned were brought up Oxford street (then called Tyburn road) to Tyburn Gallows where they met their end and in 1571 a triangular gallows was erected to accommodate more hangings. Up to 24 could be hanged at once! There would be a procession from the prison in Newgate where the bell of St Sepulcher would toll and the condemned would be allowed to stop at inns along the way for a last tipple. Often they would arrive at the gallows completely drunk. Once there they would sometimes address the crown (often the Catholics who were being hanged would talk about religious, the meaning of life and direct their anger towards the state). This provoked debate amongst the spectators who would discuss these topics afterwards, which is how Speakers Corner first came to exist years before it’s official induction. One of the most bizarre hangings was that of Oliver Cromwell who, ion 30th January 1661 (anniversary of Charles I’s execution) was dug up and hanged even though he was dead! 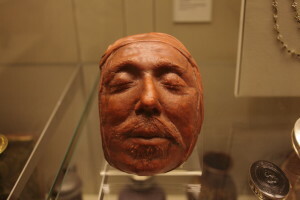 This is his death mask which can be seen at the British Museum but the original, warts and all, is at Warwick Castle. Samuel Pepyes gives an account of a hanging he witnessed in 1664 in his famous diary and how 11 000 people turned up to watch. They would have been huge spectacles. Check out this video about death masks of famous dead people. Most gruesome! 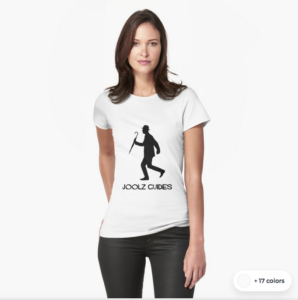 If you like this London guide about the Tyburn gallows check out and subscribe to Joolz Guides – a London Guide for Londoners!